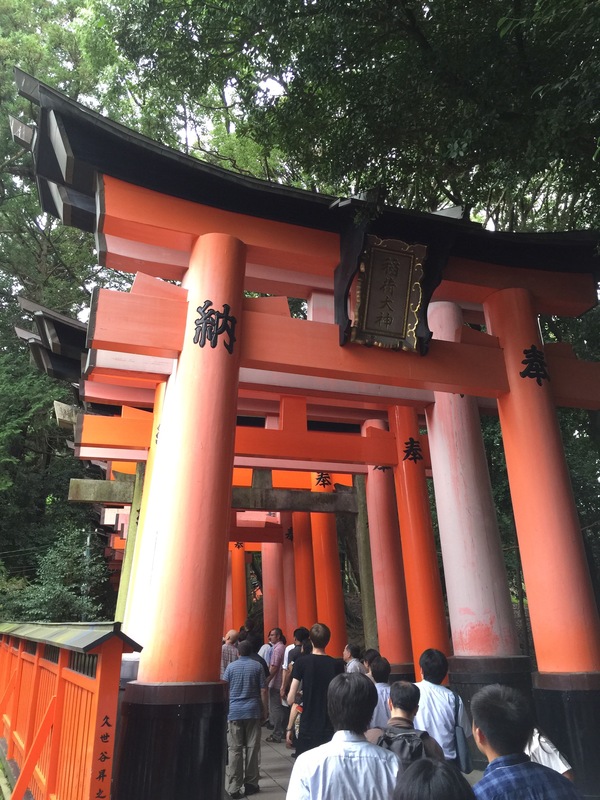 Here is a follow-up of my previous summary about the 25th Conference on Inductive Logic Programming that I have just attended in Kyoto. The current post is not self-consistent, in the sense that it should be read alongside with my summary of day 1 of ILP’2015 (to illustrate it, the numbering of this post is a continuation of the former one). I will focus here on day 2 and day 3, to conclude with general considerations about my feelings about this community and the organization of the conference. As a reminder for those willing to know more, organizers uploaded all papers on ILP website. 6/ Morning of day 2 focused on probabilistic approaches in learning. Taisuke Sato, who gave a talk about the distribution semantics he proposed 20 years ago, insisted on his conviction that probabilistic logic learning and statistical relational learning will play a major role for machine learning techniques to be able to tackle huge and noisy data, and he showed how his distribution semantics is a way to address such issues. 7/ The third – and last – invited talk, in day 3, from Luc de Raedt, also discussed probabilistic approach, more specifically probabilistic logic programming. From ProbLog (which is a probabilistic Prolog), various applications were given, from the identification of the magnetic (or not) nature of objects based on observation to biological analysis of the connection between genes in a graph. 8/ A significant number of talks emphasized the need to benefit from modern computational structure (cloud computing, clusters, …) to make the ILP approaches be able to address large-scale data. As a consequence, it is necessary to develop specific algorithms that are able to take profit from the new available infrastructures. Different methods are proposed, like the use of a MapReduce approach, specific contributions to use GPU kernels or alternative parallel-processing systems. 9/ In some applications (e.g., Luc de Raedt presented a nice and challenging case study for a robot to recognize graspable points), it is crucial to process relational kernels on graphs. Approaches around kernels arouse much efforts from the community. 10/ I have been struck by the wide range of applications of ILP approaches. While ILP, and more generally logics, is still considered as a difficult topic that many bachelor or master students fear, it definitely has many practical, useful and elegant applications. Obviously systems biology, in which I have a special interest, but also robotics (e.g., rescue robots), medicine (to analyze the correlations between medical records and illnesses), object recognization, … All these topics are really exciting, as they question our capacity to abstract the world in terms of facts, rules and more generally logics. 11/ This session of ILP ended on a panel celebrating the 25th anniversary of the conference. The chairs of the five last editions shared their views about the current trends and next outcomes for ILP. Many topics and keywords about it were discussed. Among them are the emergence of new application fields (Stephen Muggleton for example quoted synthetic ecology), the huge challenge of deep learning, or the improvement of parallel-techniques to guarantee ILP techniques can process real-life applications on a daily basis. Stephen Muggleton gives his vision of the progresses of inductive logic programming at the ILP’2015 panel. Filip Zelezny gives his vision of the progresses of inductive logic programming at ILP’2015 panel. Fabrizio Riguzzi point of view about the progress of Inductive Logic Programming at ILP’2015 panel. Gerson Zaverucha shares his thoughts about Inductive Logic Programming at ILP’2015 panel. The feelings from ILP2014 chair about the trends in Inductive Logic Programming at ILP’2015 panel. Finally, on behalf of ILP’2015 chairs, Katsumi Inoue shares his views on Inductive Logic Programming at the final panel. 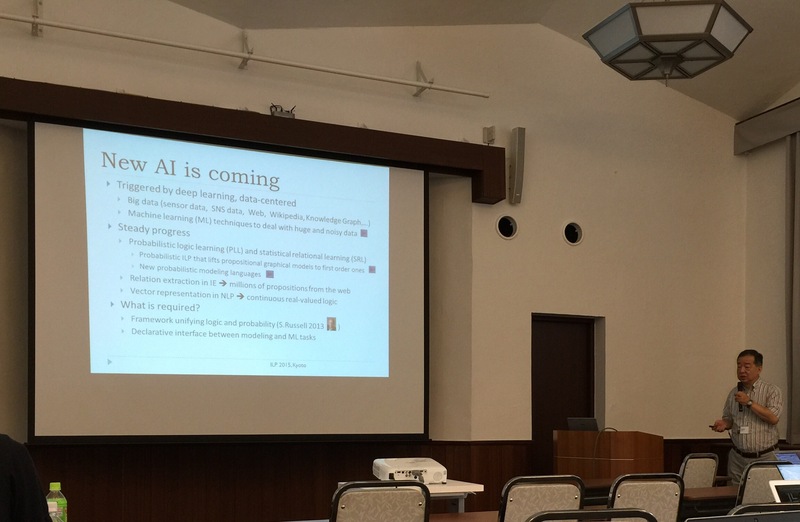 Taisuke Sato was special guest of #ilp_2015 panel to present his thoughts about Inductive Logic Programming future at ILP’2015 panel. 12/ As a first-time attendent to ILP, I was deeply interested in the quality of the talks. The mix between conceptual researches and practical illustration of the merits of such works makes the conference to be accessible. 13/ As a final word, the conference’s lunches and social dinner has contributed to make it memorable. Tasty bento, and a dinner that allowed everyone to experience being served by maikos and listen to classical shamisen dances and songs. This really was what the Japanese call omotenashi (おもてなし), i.e., the sense of hospitality. First day of ILP’2015 in Kyōto is over. This is the first time I attend the conference. It is a nice dive in this community! 1/ Meta-interpretive learning is trendy by its ability to tackle predicate invention (3 talks about it). It has promising applications for robot strategies, proof strategies and so on. 2/ Behind these “meta” interests, there is a question of designing systems that automatically find, produce and reason over consistent axiomatic systems. 3/ Biology provides challenging scientific questions for inductive logic programming, in terms of analysis of pathways, regulations or structure of components. Among relevant questions are the inference/completion of models through logical approaches, with the need to address noisy data. 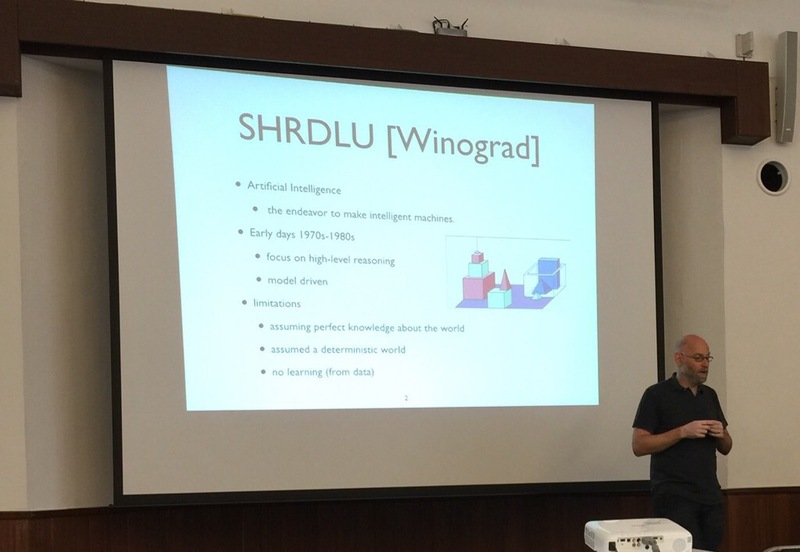 4/ I liked the prospective talk about “robot engineer”, consisting in the use of ILP techniques to produce a system that, given an action to be performed, automatically builds the robot that will satisfy/perform such goal. 5/ Finally, on a pure organizational aspect, I enjoyed the fact that all papers are available online, being able to have an overview to all of them before and during the talks. I hope tomorrow will as interesting as today! Tony Ribeiro presenting our joint work: “Tony Ribeiro, Morgan Magnin, Katsumi Inoue and Chiaki Sakama: Learning Multi-Valued Biological Models with Delayed Influence from Time-Series Observations”. July has been my second month as JSPS fellow in National Institute of Informatics, Tôkyô. I have continued to work on different collaborations here with Japanese researchers, both on bioinformatics (especially in the learning of gene regulatory networks) and systems resilience. T. Ribeiro, M. Magnin, and K. Inoue. Learning delayed influence of dynamical systems from interpretation transition. To appear in the 24th International Conference on Inductive Logic Programming. 6 pages (short paper). Nancy, France, September 2014.In a nutshell: This paper addresses the learning of (synchronous) logical programs with delayed influences from state transition diagrams. Delayed influences are captured with an inductive logic programming methodology. Note: This paper results from my collaboration with Inoue Lab. at NII. S. Carolan, M. Magnin and A-L. Kabalu. Sparking a Digital. Revolution: Digital Educational Tools in Fragile and Emerging Learning Contexts. In the 1st International Conference dedicated to Digital Society and Cultures (DI’2014). Nantes, France, September 2014.In a nutshell: This paper discusses the crucial issue of teaching and learning for people in hard environments (e.g. warzones, countries with poor or broken Internet connections, etc.) and gives insights about the added-value of recent e-Learning methods. Note: This paper results from joint work with Simon Carolan (2nd year PhD student who I co-supervise) and Anne-Laure Kabalu (Master student who Simon and I have co-supervised this Spring). S. Carolan, F. Chinesta, C. Evain, M. Magnin, G. Moreau. Extracting domain ontologies from reference books. Short paper and poster in the 14th IEEE International Conference on Advanced Learning Technologies (ICALT’2014). Athens, Greece. July 2014.